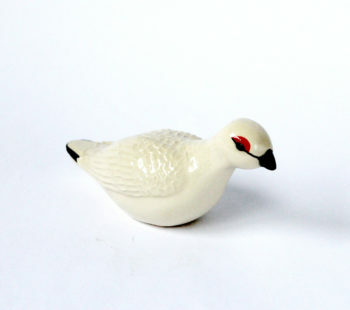 This Rock Ptarmigan is handcrafted by Rósa Valtingojer and it is made of ceramics. Every bird is unique, hand formed, painted with precision and glazed. Size of the bird is 14 x 8 x 6 cm. Bird is safely packaged for shipping. The Rock Ptarmigan is one of the main species in the Icelandic ecological system and symbolic for the nature. It is a game bird within the grouse family and has a big role in the Icelandic Christmas cuisine. Hunting Rock Ptarmigan has been a popular sport in Iceland, but in recent years hunting has been more strictly controlled in order to protect the stock. The Rock Ptarmigan appears in Icelandic folklore, f.x. it was said that if a pregnant woman would eat Rock Ptarmigan eggs her unborn child would become freckled, and it was considered that by observing the Rock Ptarmigan behavior one could forecast the weather.